As Mitt Romney Woos Latinos, Obama's Team Derides A 'Makeover' : It's All Politics The Republican presidential nominee's message: President Obama's economic policies have failed the nation generally and Hispanics specifically. But the challenge Romney faces with Hispanics was illustrated by a new poll that showed him lagging behind Obama. 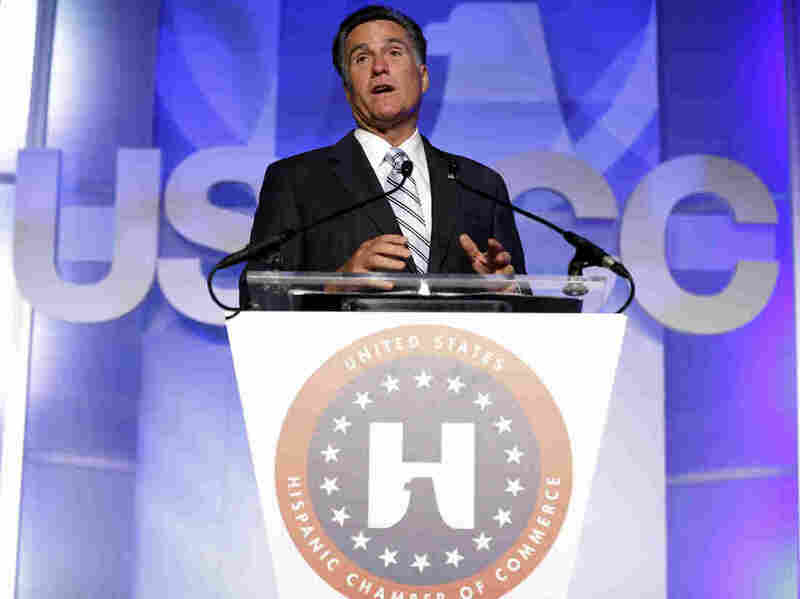 Republican presidential nominee Mitt Romney made his pitch for Latino votes at the U.S. Hispanic Chamber of Commerce convention in Los Angeles on Monday. Mitt Romney made yet another attempt Monday to narrow President Obama's substantial polling lead over him with Latino voters. The Republican presidential nominee spoke at the Los Angeles convention of the U.S. Hispanic Chamber of Commerce where he was respectfully received. His message? Obama's economic policies had failed the nation generally and Hispanics specifically. Also, there was plenty for Latino entrepreneurs to like in the low-tax, light-regulation policy prescriptions that Republicans offer. ROMNEY: "Candidate Obama said that one of his highest priorities would be to fix immigration in his first year in office. Despite his party having majorities in both houses of Congress, the President never even offered up a bill. Like so many issues confronting our nation, when it comes to immigration, politics has been put ahead of people for too long. "I will work with Republicans and Democrats to permanently fix our immigration system." But the daunting size of the challenge before Romney was not so much measured by the polite if tepid applause such lines received as much as it was by repeated polling that shows him lagging badly with Hispanic voters. The latest, released Monday by Latino Decisions, showed Obama leading Romney by 53 points among Hispanic women and 29 points among Hispanic men. And a surprising twist that threatened to overshadow Romney's outreach this week to Latinos was the emergence of a video Mother Jones brought to widespread attention. The video was apparently recorded secretly at a private event and purportedly shows Romney joking that if his father were Mexican instead of just born in Mexico, "I'd have a better shot at winning this." Meanwhile, Obama's campaign was working hard to undercut Romney by reminding Latino voters of the steps the president has taken to stop deportation proceedings against young illegal immigrants who meet certain conditions. In a prerecorded message to the Hispanic convention, Obama mentioned his unilateral action to put certain parts of the DREAM Act into place and called for Congress to pass the associated legislation. This drew enthusiastic applause from the audience. In addition, the president's campaign sought to remind Latinos of the tougher positions Romney articulated on illegal immigration during the Republican primaries. In a GOP debate during the primaries, Romney called for illegal immigrants to self-deport. A video the Obama campaign released before Romney's speech began: "This week on Mitt Romney: Extreme Makeover Campaign Edition, Mitt Romney is faced with one of his most implausible makeovers yet: making his extreme policies seem appealing to Latino voters."